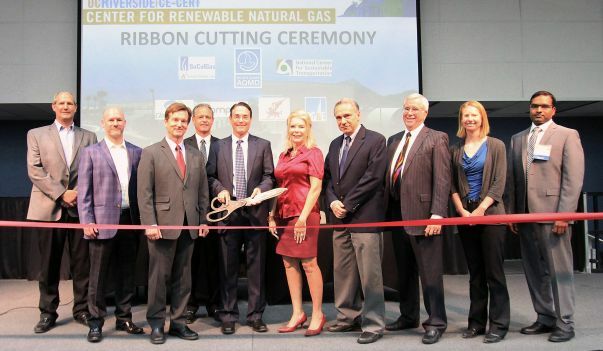 On Wednesday, the University of California, Riverside announced a partnership with Southern California Gas Co. to explore making advancements in the research and application of renewable natural gas (RNG) technologies. The partnership, which will result in a new on-campus facility named the Center for Renewable Natural Gas, is the first of its kind, according to SoCalGas. It aims to both improve technologies that allow vehicles to run on RNG, and remove legislative and commercial barriers that might hamper firms in the space. The Center, located in Inland Southern California, will put a particular focus on studies and research for technological advances in renewable fuel use for heavy-duty trucks and other large vehicles. “We support the Center at UC Riverside because renewable natural gas deployment in near-zero emission trucks provides a triple win for the region: green jobs, sustainable transportation and lower tailpipe emissions," said Wayne Nastri, executive officer for the South Coast Air Quality Management District, a smog control agency serving Southern California. Renewable natural gas is typically derived from methane on sites with excess amounts of the greenhouse gas, such as dairy plants, farms, landfills, and wastewater treatment plants. When methane is harnessed to create renewable gas, it creates a new, nearly emission-less source of fuel, as reported by SoCalGas. In California alone, it is believed that enough renewable gas could be produced to replace 75 percent of the state’s consumption of diesel fuel, while not causing any significant disruption to consumers, according to the energy company. On the Center’s website, UC Riverside notes how RNG has up to 90 percent less carbon impact than conventional fuels. It can serve as a viable fuel source on its own, or can be blended along with conventional natural gas, according to the site. UC Riverside, which has nearly 23,000 enrolled students, held a ribbon-cutting ceremony to announce the new facility. SoCalGas, a subsidiary of Sempra Energy, a Fortune 500 firm, is the largest natural gas distribution utility in the United States. It is providing funding to help build the Center.